"As part of the exterior look, portholes have been restored as it was before whenever possible"
She was a relic of the Cold War, a former Soviet spy ship short on comfort but with a long and mysterious history. A seven-year, multi-million pound refit later, the 65.4 metre La Sultana has emerged as a majestic and luxurious motor yacht, a throwback to a golden age of grand and exotic travel. For a 1962 “passenger ferry”, the Soviet-built Aji Petri began yielding some powerful equipment eight years ago when a refit team started to poke about in her darker corners. There were some surprising discoveries: thick electronic cables with massive power output, which ran throughout the ship, and lots of long radio antennae. And there were real eyebrow raisers: a radioactivity detector of the sort used to find nuclear submarines during the Cold War; and a thick layer of aluminium insulating the entire boat, to prevent sensitive communications being tapped from shore. It all helped the refit team piece together the remarkable history of Aji Petri, of how, in the early 1970s, the Soviet Union removed its passenger fleet from the Black Sea to use the boats for strategic purposes. Officially, the 65.4 metre Aji Petri was sent to the North Atlantic in the service of the International Telecommunication Union. Unofficially, it is believed that she was eavesdropping on conversations between the US and the UK. Today, Aji Petri has most certainly come in from the cold. After the Soviet Union fell, she resumed her ferry duties and, by 2007, although she was still in her original form, she was being used as a pleasure boat by a private owner in Hammamet, Tunisia. Attracted by her classic silhouette and hardy construction, the La Sultana hotel group decided to buy her and undertake an extensive refit. The project took place in Casablanca, under the supervision of Orion Naval Engineering, a French company with a commercial background – and the boat emerged last year as La Sultana, a glamorous gentleman’s yacht, crewed-up, berthed in Malaga and ready to charter in the Med. The transformation is striking and well judged, making drastic changes where necessary and adding luxurious facilities but retaining and even highlighting elements that speak to her fascinating history. It was quite a job. The ship was built on the shores of the Black Sea at the Georgi Dimitrov shipyard in Varna, Bulgaria, the fifth of a series of 12 ships that would carry passengers and freight between the ports of Odessa, Yalta, Sebastopol and Istanbul. The fleet was sufficiently well known to have featured in a series of Russian stamps. The ship may have been 45 years old when the La Sultana Group rescued her, but her structure remained sound and, perhaps most importantly, she was one of those vessels, built between the 1920s and 1960s, whose lines wash up a feeling of nostalgia for the golden age of yachting. Many of the best known classic motor yachts were purpose-built: think the 64 metre Shemara, built by Thornycroft just before the Second World War for British businessman Sir Bernard Docker, or 1920s starlets dancing on the deck of the 78 metre Delphine, built for Detroit car mogul Horace Dodge. But one of the most famous classics had absolutely no blue blood. 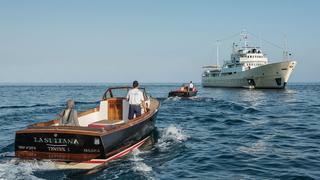 Aristotle Onassis bought a 99 metre 1943 frigate for its scrap value and, in 1954, refitted her into a true yacht, the legendary Christina O, on and around which he created the scene that superyachters have been trying to recapture for half a century. La Sultana would continue this rags to riches tradition. Inside, bigger changes were necessary, so big in fact that, aside from La Sultana's shell and certain carefully chosen decorative elements, she “may be considered a new vessel,” says Laurent Marbeau, a naval architect at Orion. 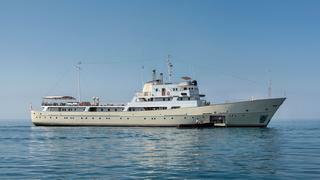 Aji Petri was built to accommodate 102 passengers in cabins, 110 more standing on the deck and 46 crew members. 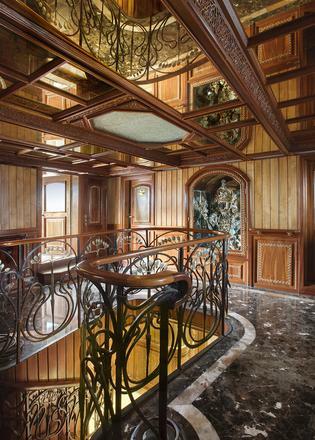 A luxury yacht requires far fewer of both and much bigger spaces, so the interior was largely ripped out and rebuilt. “The most affected region in terms of reordering was the middle of the main deck area, where there were 40 cabins,” says Marbeau. Now there are only two. The massive engine room has been totally revamped with a new Mitsubishi engine, four new generators plus an emergency, and just about every bit of kit you could imagine. “There is not one [original] wire left in the entire boat,” says the owner. With a 40,000 litre fuel capacity and economical consumption – 120 litres at 11 knots – La Sultana has a world-roaming 5,000nm range. To this end she now has a waste water treatment plant and a desalinator for freshwater production. Structural changes included adding what Marbeau describes as “a massive keel” to improve seakeeping and comfort without adding dynamic stabilisation, and creating a new guest space on the lower deck. “The design and implementation of the side door in the area of the indoor pool and spa, this was also a great achievement,” says Marbeau. It has created a spectacular entrance to La Sultana. 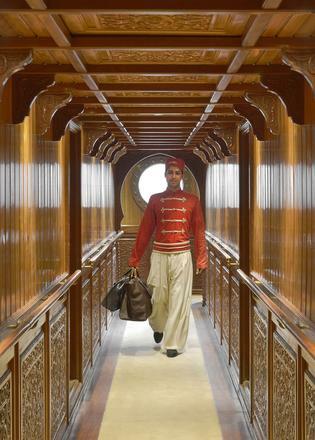 Guests arrive by tender to a lobby on the water, where the tone is set with a tiled five metre swimming pool (with contraflow) next to a traditional hammam. 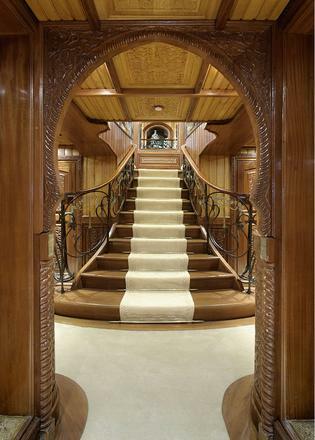 From here a corridor leads past four lower deck guest cabins, all with en suites, to a massive central lobby where a grand staircase sweeps up to the main deck. This was inspired by the famous Monnaie du Pape banister by art nouveau designer Louis Majorelle. Upstairs, the proportions in communal areas stay macro, with a broad dining saloon and even larger lounge further aft, as well as an alfresco dining area to stern. 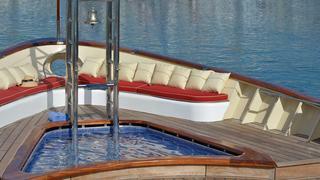 Deck spaces on _La Sultana _are large and lovely, with a sweet seating area and lots of sunbathing space on the upper deck aft, plus a classically styled spa pool on the foredeck, just forward of the helipad. 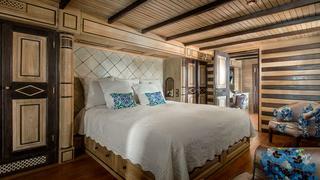 There are three standards of cabin aboard: the four lower-deck Prestige Cabins, which, with en suite showers and 22 square metres of space, are nothing to be sniffed at; the two 36 square metre Deluxe Suites forward on the main deck and the Armateur Suite, a 66 square metre apartment that sprawls alone on the upper deck, with a circular bed and fantastic views out over the foredeck and seascape. Two Nantucket tenders from the limited-edition Sellerie by Lancel line were chosen for their retro design but La Sultana also boasts plenty of modern toys, plus dive equipment and a Mini Moke 4x4 for exploring. Throughout La Sultana the décor – by La Sultana Group’s in-house studio – is rich, with elaborate woodwork by Moroccan master craftsmen in mahogany, cherry wood and cedars from the Atlas mountains; millettia and Brazilian cherry for the floors; iroko and ipe for the decks. There are marbles and onyx in the en suites, velvets and embroidered silks for upholstery, as well as brass flourishes. You’ll also find carefully chosen artworks by Jilali Gharbaoui and Edouard Edy-Legrand. The mixture is toned down by a spare and muted palette, particularly among the woods. 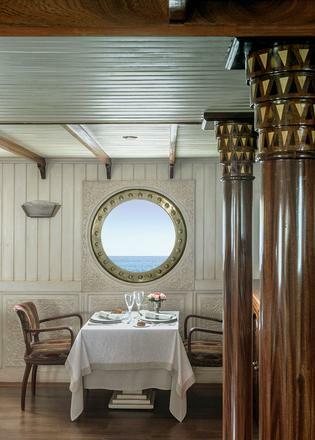 “The style of the interior is art deco and oriental, with influences from the belle époque and cruise lines from the previous century,” says the owner. You can see what he means about reaching into the past. The eclectic, eccentric style of _La Sultana _– especially the combination of a classic motor yacht structure and North African-influenced décor – is evocative of a time when sea travel was luxurious, exotic and romantic. 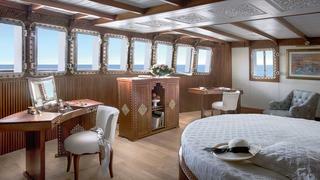 Of the seven guest cabins, the Armateur Suite is the largest and grandest. The suite has a highly decorative living area and a separate office. 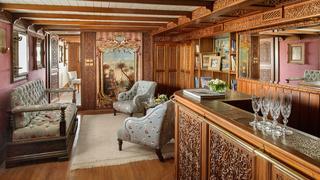 Perhaps it is the art deco touches but one half expects to bump into Hercule Poirot strolling down the aft deck. Indeed, Marbeau says he suggested the owner name the boat The Orient Express. This effect is heightened by what the designers have left alone, or highlighted. This includes technical equipment such as the original, still-working Chadburn engine order telegraph – in Cyrillic – and the steering gear control, with a button for left, a button for right and a central boost button for quick-left and quick-right. 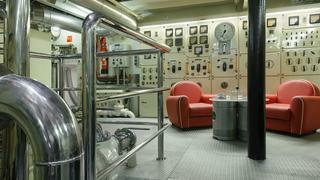 Perhaps the best example is the electrical control panel in the engine room of La Sultana, now purely decorative and the centrepiece of an unorthodox seating area with mid-century armchairs. You picture men in horn-rimmed glasses drinking whisky here. On the upper aft deck a skylight looks right down to watch them sip. They’ve even turned the original ship’s bell into an on-deck shower. 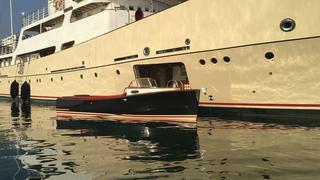 As Marbeau says, the “ship has kept its soul, and magnified its beauty and class”. It seems unlikely her Soviet creators would have approved, but she’s certainly a triumph for Western decadence.